You'll never believe it - Eugene has invented a robot version of Whit! And if you think that's strange, wait until you hear about all the other odd things going on in Odyssey: Eugene and Connie are getting married? Tom is shutting down the Timothy Center so Bart Rathbone can turn it into a space camp? And-most amazing of all - Harlow Doyle actually solves a case? What in the world is going on? 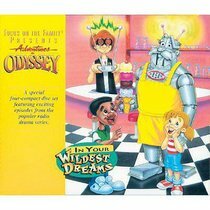 About "In Your Wildest Dreams (#34 in Adventures In Odyssey Audio Series)"
You won't believe what's going on in Odyssey these days! Eugene and the kids at Whit's End build an invention that looks just like Whit, Aubrey battles a lion in her own backyard, and Bernard tells a wild tale about God's grace. Of course, it's all In Your Wildest Dreams, in this latest album from Adventures in Odyssey!